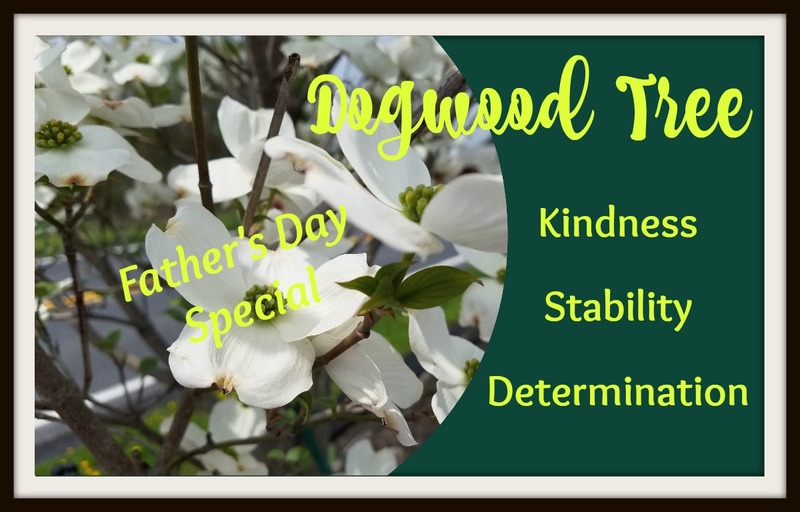 Father’s Day Dogwood Tree Special! You are here: Home / Blog/News / Blog / News / Father’s Day Dogwood Tree Special! Dogwood trees are an enjoyable tree for home gardeners due to its manageable size and availability. However, did you know that there is a religious significance behind its twisted and slender trunk and beautiful flowers? Legends talk about the dogwood trees growing near Jerusalem, and a large, strong tree was used to create the cross for many crucifixions, including Jesus Christ. The legend says that the tree felt tormented because of the way its trunk was used, and Christ, realizing its suffering, changed the dogwoods shape and form so that it could never be used for making crosses in the future. In some versions of the legend, it is said that God cursed the dogwood trees after the crucifixion of Christ. However, all the versions of this legend claim that the form of dogwood trees has changed ever since. Dogwood trees became shorter. The tree trunks became twisted and slender. Every flower of a dogwood tree, now has only four petals, which symbolize four points of a cross. On each petal corner, there are nail-like markings with some having the rusty-red color of Jesus’s blood. The stamen in the center of the flower symbolizes the Jesus’ Crown of Thorns. The whole tree has become a symbol of crucifixion of Jesus Christ. ◆ In a myth concerning dogwood trees, Cherokee Indians, people of a native American tribe believed that there are little people residing in these trees. The legend has it that these little people protect babies and old people. ◆ According to another legend, dogwood trees were Adam’s favorites in the Garden of Eden. The devil is said to have climbed the tree and damaged its blossom. However, when the flower turned into an image of a cross, he could only bite the edges of the flowers. Therefore the flowers grew spikes in their center to keep the devil away from Eden. Dogwood trees symbolize life. The dogwood blossom that springs every Spring indicates the end of winter (death) and the beginning of a new life. Dogwood trees also represent joy and beauty that a new life or rebirth brings. The color white represents purity and innocence. Likewise, the white blossom of dogwood trees represents the purity of Christ. In the Victorian era, a male suitor would offer flowers from dogwood trees to an unmarried woman to proclaim his affection for her. The twisted and small branches of dogwood trees symbolize the promise that Jesus Christ gave the tree to avoid its use in making crosses. The trees represent the gesture of keeping promises. This symbolic meaning of dogwood trees comes from the lasting quality of the dogwood tree wood. The four petals with rusty-looking edges symbolize the cross on which Jesus Christ was crucified. The spiked stamen that can be found at the center of the dogwood flowers symbolizes the Crown of Thorns worn by Christ at the time of crucifixion. This meaning of the trees might have originated from the Christian legend. Pink dogwood flowers are considered to be blushing with shame for the cruel use of the tree’s trunk in making the cross to crucify Christ. In the fall season, dogwood trees cover themselves in blood-like red leaves. Those red leaves represent Jesus Christ’s blood spilled at Cavalry. The red color of the fruit is also considered as the innocent blood spilled. Dogwood trees symbolize a range of emotions. The changing colors of dogwood trees through different seasons, can be taken as a symbol of the cycle of life.